NCECA is coming to Seattle! NCECA, the National Council for Education on the Ceramic Arts, is the largest ceramics conference in States and every year is in a different city. This year, Seattle is playing host to this grand event. I’m extremely excited about it. The conference consists of three days of panels, lectures, and discussions and draws in about five thousand people every year. However, even more exciting to me is the fact that there will be approximately 190 ceramic art shows going on in the Puget Sound area. (A pdf of all the exhibitions can be found here.) My artwork will proudly be displayed in five of these shows. This should be a month of fun, a month of opening receptions, and a month of eating small cubes of cheese and pita chips. The first of these shows to go up is “Through the Clouds”, a multi-piece installation featuring my largest beast yet. 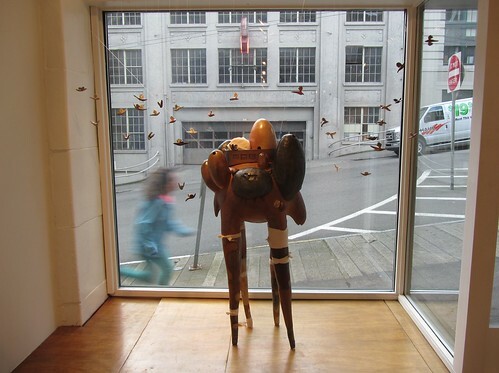 It’s in the front window of Gallery 110 in the Pioneer square area of Seattle. While the opening reception has already occurred, there’s going to be an additional reception during NCECA, on March 17th from 6 to 8pm. I’m also sharing the gallery with Becky Frehse, Jane Kelsey- Mapel, and Monika Dalkin. I’m very excited to be showing off this piece, which has been in progress since December. Also, this part of Pioneer Square is a positive warren of art galleries, many of which share the same building at Gallery 110. I’d recommended taking some extra time to explore the area, if you can! 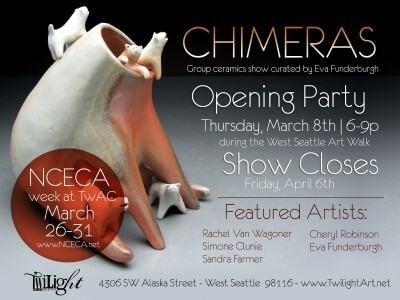 Next up on my schedule of shows is Chimeras, a show I curated up at my old stomping ground, Twilight Artist Collective in West Seattle. This show is pretty exciting, since it’s given me a chance to collect some of my favorite sculptors in one place. It’s going to be featuring Rachel Van Wagoner, Sandra Farmer, Simone Clunie, and Cheryl Robinson. It will also be a chance to show off some of my best work from my most recent firing. The opening reception is this Thursday, March 8th, from 6 to 9pm. There’s also going to be an extra reception during NCECA, on March 30th from 6 to 9pm, so we can celebrate with all the out of town ceramics folks. Switching from North Seattle to South Puget Sound, I’m also in a show in Tacoma. This year, the Washington Clay Arts Association’s annual show was juried by Josh DeWeese and Beth Cavener Stichter, of whom I’m a very big fan. This makes it even more of an honor that three of my sculptures were selected to be included in the show. The show is at The Art Stop on 940 Broadway and will have an opening reception on Thursday, March 15th from 5 to 8pm. It’s also going to have a NCECA reception on the evening of the 27th. The final show that I’m going to be in during NCECA is a shorter affair and is only open the week of the conference, from Monday, March 26th through Saturday, March 31st. It’s called “12 Wood Fire Kilns of the Northwest”. I’m extremely excited about it, and while I realize I’ve been saying that about all my shows, it’s the truth. In this case, the show will feature wood kilns from around the Pacific Northwest, with each group of wood firers having their own little area to show of the style of work and results from the kiln. I’ll be there, helping to represent the two anagama-style kilns “Santatsugama” (Three Dragon Kiln) and “Ochawangama” (Teabowl Kiln). These two kilns basically siblings, being built and fired by mostly the same group of people. I’ve been firing with this group of compatriots since 2006, and it’s a wonderful group of friends and artists. It will also be fun to compare and to contrast the work from the different kilns in the area. The show will be at 3509 Fremont ave N, Seattle WA, and will have an opening reception from 6 to 9pm on the 29th.